Paul says that Christ was raised on the third day in accordance with the Scriptures. The only question that one must ask is, Where? Where in Scripture does it say that the Christ is to be raised on the third day? And why the third day? Christ was raised on the first day of the week, which is why Christian’s celebrate Christ’s resurrection on the first day of the week. The Gospels are replete with references to Christ’s resurrection happening “after three days” or “in three days.” But is there a difference between “the third day” and “three days”? Or is this just two ways of expressing the same thought? Of course Jesus rose from the dead after three days of being in the grave. That is not being questioned here. The purpose of this paper is to explore the possibility of not only a “third day” theme that runs throughout Scripture, but a “third day resurrection” theme that would make sense of Paul’s statement in 1 Corinthians 15. Indeed, Jonah was “resurrected” after three days of being in the belly of the great fish, which he calls “Sheol” (Jon. 2:2). Thus it is a fitting analogy that Jesus uses to describe his own resurrection in Matt. 12:40. The particular phrase “the third day” is not used with reference to Jonah, but rather “three days and three nights.” Thus, while a third day motif can be easily inferred from Jonah, and is even one in which Jesus references, for the purposes of this paper, it does not meet the requirements of specifically being a literal “third day” resurrection event, though it is by extension. This reference is more specific and it begins to meet the requirements of a “third day” resurrection motif from which we can hang our hats when trying to understand Paul’s peculiar phrase. But the passage says that on the third day he will “raise us up.” God is pictured as raising up Israel on the third day, not the Messiah. It is not unsurprising then that most liberal scholars do not even entertain the notion that Jesus Christ is the true Israel and her resurrection is to be found in Him and His resurrection. Instead they hypothesize that the passage finds its fulfillment at some other time in history. But as Pusey notes in his commentary on the Minor Prophets, there is a great lack of any evidence to which historians and theologians alike can make appeal to qualify as the event to which the text speaks of. Sweeney though takes a step further and postulates that the “raising up” takes place possibly in the advent of the rainy season. In saying this he unhesitatingly connects Israel to other ancient near eastern pagan fertility concepts, making appeal to verse three’s reference to the “spring rains” for support. Peter Leithart on the contrary finds that Hosea 6:1-2 finds its ultimate fulfillment in Christ. He says, “Hosea exhorted Israel to return to the Lord: He has torn, but He will revive and raise us on third day (v. 2). Christ, the True Israel, was torn, but revived. He was torn by beasts, but, as a descendent of Judah He devoured His enemies, was raised up and exalted, like Joseph, to be ruler over all.” Hosea 6:2 then is a strong contender for Scriptural fulfillment of the literal “third day” resurrection theme, but I question whether it is the only passage to which Paul makes his appeal. We must look elsewhere to see if Paul could have had other passages in mind when he penned that particular phrase. Let us continue our study then by looking at the very first recorded “third day” in Scripture. On the third day of creation the dry land “emerges” as it were from the underneath its watery grave. Vegetation begins sprout. Seed yielding plants, as well as fruit trees bearing fruit in which is their seed are also created on the third day. Prior to this on the first and second days of creation, nothing “living” had been created. It is on the third day that we see the very first living things come alive. It is the creation itself which comes alive and “brings forth” new life, on the third day. In Genesis 40 we are presented with a third day resurrection motif, but we are also presented with a picture of third day death as well. The baker and the cup bearer were in prison with Joseph. They both had a dream and Joseph interpreted the dreams accordingly. The cupbearer was restored back to his place, while the baker was hanged. This happened on the third day of Pharaoh’s birthday, according to Gen. 40:20. In the context of the Joseph narrative Pharaoh’s judgment changed things for both the cup bearer and the baker, for Joseph as well, ultimately and eventually if not right away. It was Joseph’s ability to interpret dreams that changed his predicament, and when the Pharaoh himself had some bad dreams which no one who could interpret, the cup bearer remembered Joseph. This led to Joseph becoming second in command throughout all Egypt, and his wisdom enabled Egypt to survive the famine and it brought the Hebrews into the beautiful land of Goshen, which was the best of the land of Egypt. This is a type of resurrection that occurred, in which a more mature time was initiated. The cupbearer, Joseph, Egypt, and the Hebrews all were preserved from the death of famine due to the fulfillment of Joseph’s interpretation of Pharoah’s dream on the third day. “Do this and you will live, for I fear God: 19 if you are honest men, let one of your brothers remain confined where you are in custody, and let the rest go and carry grain for the famine of your households, 20and bring your youngest brother to me. So your words will be verified, and you shall not die." And they did so. In Exodus 19, Israel came to Mt. Sinai. Verse 1 says it was “on the third new moon” that they arrived at Sinai since they left Egypt. Verses 11 tells us that Israel was to prepare h erself for “the third day” when “the LORD will come down on Mount Sinai in the sight of all people.” Verses 16-20 tell of the great majesty and glory of God who appeared to Israel on “the third day” on top of Mt. Sinai in fire, smoke, thunder, and lightening. While Moses was on the mount he received the Ten Commandments and the Book of the Covenant. Thus, Israel’s covenant inauguration/renewal ceremony took place on the third day. The prologue to the Ten Commandments reiterates this resurrection theme when God says, “I am the LORD you God who brought you out of the land of Egypt, out of the house of slavery.” This is resurrection language. “You were once dead in Egypt, but now you are alive, therefore serve me” is the essence of what God is saying. This proclamation takes place not just on the third day, but on the third day of the third month/third new moon. This analysis seems to fit with Jesus’ understanding of the flow of history in John 5. Jesus said “For an hour is coming (future) and is now here (present), when the dead will hear the voice of the Son of God, and those who hear will live.” The third day cleansing represents Christian baptism (the first resurrection) and the seventh day cleansing represents eschatological cleansing (the second resurrection). A person who has encountered death needs to be cleansed twice, once in the middle of history and once again at the end. The cleansing/resurrection in the middle of history and again at the end of history corresponds to the two cleansings/ two resurrections found in Numbers 19. Saint Paul also affirms this truth when he speaks of the resurrection in 1 Corinthians 15:23 – each in his own order: Christ the first-fruits, then at his coming those who belong to Christ will be resurrected. As Jordan has noted, not all third day events actually happen on the third day, but on the third year, hour, and month as well. With this in mind we see that this pattern fulfills Deuteronomy 14:22ff and 26:12ff which speaks of the tithe that had to brought in every third year. We know that the tithe was to be brought in during the Feast Booths, which was highly symbolic in nature, representing in very graphic details the resurrection and the salvation of the entire world, and even the creation itself. It was on every third year after Israel paid their tithe and gave it to the Levite, the widow, and sojourner and the fatherless that they were to remind God of what they had done and remind Him to “Look down from your holy habitation, from heaven, and bless your people Israel and the ground that you have given us, as you swore to our fathers, a land flowing with milk and honey.” Thus, Israel was to remind God to restore/resurrect their land after they had just celebrated the Feast of Booths which was an anticipatory celebration in which they looked forward to God’s future salvific blessings. After they had just acted out life in the New Creation, they were to call upon God to fulfill those promises which He made to them in the Feast of Booths. This is nothing less the resurrection on a grand scale. In summary, we have to say that we have only scratched the surface of the third day, hour, month, year, etc. theme in Scripture. We focused most of our time only looking at third day resurrection themes in the Pentateuch, all of which make a very strong case for Paul’s appeal to “The Scriptures” in 1 Corinthians 15. A more complete and thorough study could and should be made of the third day, year, etc events in the other narrative portions of the Bible. 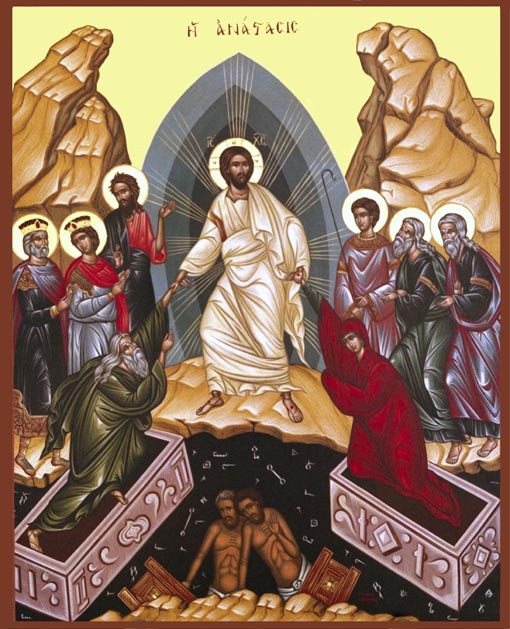 Seeing the many different ways in which the resurrection motif manifests itself throughout the Scriptures gives us more insight into the resurrection of our Lord Jesus Christ on the third day, as well as our resurrection in Him, bringing us deeper into the mysteries of God and the greatness of our salvation. Indeed, all Scripture speaks of Him. Bruce, F.F. The Book of Acts: NICNT. Grand Rapids: Eerdmans, 1988. Chilton, David. Days of Vengeance: An Exposition of the Book of Revelation. Fort Worth, TX: Dominion Press, 1987. _______. Paradise Restored: A Biblical Theology of Dominion. Horn Lake, MS: Dominion Press, 2007. Crim, Keith R. and George A Buttrick. The Interpreter’s Dictionary of the Bible, Vol. 4, R-Z. New York: Abingdon, 1962. Farrer, Austin. A Rebirth of Images: The Making St. John’s Apocalypse. Albany, NY: State University Press, 1986. Jordan, James B. The Handwriting on the Wall: A Commentary on the Book of Daniel. Powder Springs, GA: American Vision, 2007. _______. The Law of the Covenant: An Exposition of Exodus 21-23. Tyler, TX: Institute for Christian Economics, 1984. Landes, George M. “The Three Days Three Nights Motif in Jonah 2:1” in the Journal of Biblical Literature Vol. 86, No. 4 (Dec., 1967), 446-450. Landy, Francis. Hosea. Sheffield, England, Sheffield Academic Press, 1995. Leithart, Peter “Prey in My House” Biblical Horizons Newsletter, no. 8 (November, 1989), Biblical Horizons. http://biblicalhorizons.com/biblical-horizons/no-8-prey-in-my-house/ (Accessed 2 February, 2011). Pink, A.W. Gleanings in Genesis. Chicago: Moody Press, 1922. Pusey, E.B. Barnes Notes on the Old Testament: The Minor Prophets: A Commentary, Vol. 1. Grand Rapids: Baker House Book, 1970. Ryken, Leland, James C. Wilhoit, and Tremper Longman III, eds. IVP’s Dictionary of Biblical Imagery. Downers Grove: IVP, 1998. Sweeney, Marvin A. and David W. Cotter, ed., Berit Olam: Studies in Hebrew Narrative and Poetry: The Twelve Prophets. Collegeville, Minnesota: Liturgical Press, 2000. Zvi, Ehud Ben. Hosea: The Forms of the Old Testament Literature, Vol. XXIA/1 (Grand Rapids: Eerdmans, 2005). This is the conclusion of a very brief article written in The Interpreter’s Dictionary of the Bible, Vol. 4, R-Z (New York: Abingdon, 1962), 630. See George M. Landes, “The Three Days Three Nights Motif in Jonah 2:1” in the Journal of Biblical Literature Vol. 86, No. 4 (Dec., 1967), 446. E.B. Pusey, Barnes Notes on the Old Testament: The Minor Prophets: A Commentary, Vol. 1 (Grand Rapids: Baker House Book, 1970), 63-64. Peter Leithart, “Prey in My House” Biblical Horizons Newsletter, no. 8 (November, 1989), http://biblicalhorizons.com/biblical-horizons/no-8-prey-in-my-house/ (Accessed 2 February, 2011). F.F. Bruce, The Book of Acts: NICNT (Grand Rapids: Eerdmans, 1988), 215, n. 61. James B. Jordan, The Handwriting on the Wall: A Commentary on the Book of Daniel (Powder Springs, GA: American Vision, 2007), 130 (italics mine). Jordan doesn’t limit this third day motif to days only, but he believes this pattern of resurrection can be seen on third years, month, hours, as well as days. The baker of course was not “resurrected” but put to death. See Austin Farrer, A Rebirth of Images: The Making St. John’s Apocalypse (Albany, NY: State University Press, 1986). His argument is essentially that the seven cycles are de-creation cycles. In each of the seven cycles there is judgment upon each of the days of creation, for seven cycles, each cycle representing a week. Here we see that the third day motif, though not explicitly mentioned as such, does also contain death and judgment as well as resurrection and life. The baker illustrates for us that the third day theme does not have to be only resurrection, though it is mostly. Jordan, The Handwriting on the Wall, 130. David Chilton, Paradise Restored: A Biblical Theology of Dominion (Horn Lake, MS: Dominion Press, 2007), 44-46. For a different approach to the third day motif, see Leland Ryken, James C. Wilhoit, and Tremper Longman III, eds. IVP’s Dictionary of Biblical Imagery (Downers Grove: IVP, 1998), 864.